Abu Dhabi, the capital of the United Arab Emirates, might not be that famous like Dubai and you might wonder about the “best things to do in Abu Dhabi” or the best Abu Dhabi travel itinerary – and even though there is not as much info on Abu Dhabi as on Dubai, this city (and emirate) is a wonderful place to visit. This post gives all important travel tips for your first time in Abu Dhabi, about the best places to visit and best things to see in Abu Dhabi – you will also find out about important do´s and don´ts in Abu Dhabi. Are you ready to find out about the best places to visit in Abu Dhabi? Before talking about 15 fun things to do in Abu Dhabi here is a short pre-travel guide for Abu Dhabi. A few years ago Abu Dhabi was still a hidden gem and people would rather visit Dubai than its bigger sister. However, over the last years, there has been a lot going on in Abu Dhabi and it is definitely worth to visit the capital of the Emirates. 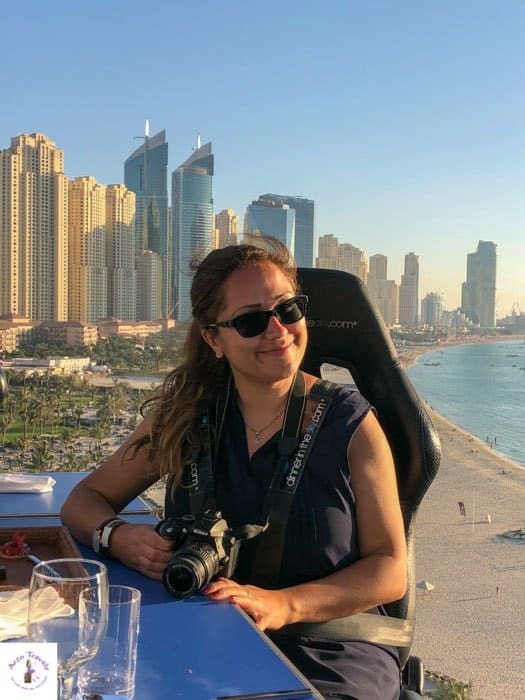 I have visited Abu Dhabi twice and I will most likely visit again in the near future – I just love the city, the safety, cleanliness and different activities you can do in Abu Dhabi. Of course, there are fewer attractions in Abu Dhabi than in Dubai, but it has its own charm and here are my favorite places and best tips for Abu Dhabi. 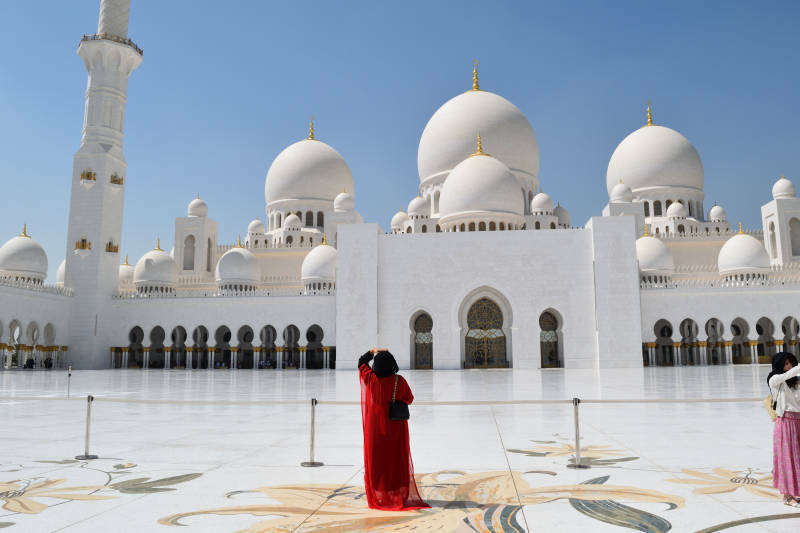 Before talking about the best activities in 1, 2, 3, 4, 5 or even 6 days in Abu Dhabi, here are a few important travel tips for your Abu Dhabi trip. Abu Dhabi probably is not as famous as Dubai (both cities border each other) but is actually the capital of the United Arab Emirates, and also has quite a lot to offer. 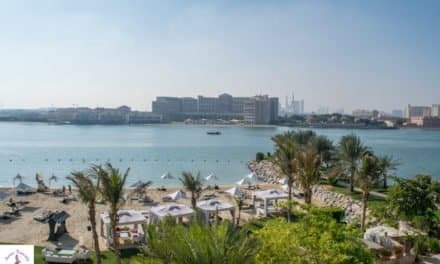 While I have written a more detailed post about the differences between Dubai and Abu Dhabi I recommend Abu Dhabi to anyone who enjoys nice beaches and a more authentic feeling of the UAE. Any intimacy between couples should be reduced to a minimum (even holding hands) and is forbidden in some places (mosques etc.). Never drink in public (except in restaurants etc.) and do not get totally drunk. Though the UAE is an Islamic country, you do not have to cover. However, you should be aware that there are dress codes in many places like shopping malls or public places. You can wear bikinis at the beach and shorts/skirts in many places but probably should not take the shortest and tightest clothes you have. If you want to find out more about the dress code for Abu Dhabi you can read my post about “What to wear as a female in Dubai” (though Abu Dhabi is a bit more conservative the post gives you some great ideas about the dressing behavior in Abu Dhabi as well). Scroll down to read more about “What to pack for Abu Dhabi”. Is Abu Dhabi Safe for Tourists? 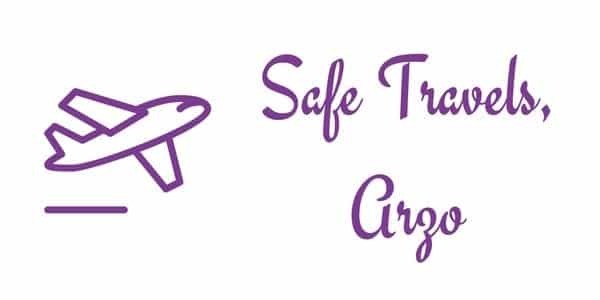 I personally think Abu Dhabi, like Dubai, is a great place to visit as a tourist, because it is safe – Abu Dhabi tourist places are safe in terms of crime, terror, and also a great solo female travel destination (read more about safety in the UAE here). I visited Abu Dhabi as a solo female traveler and absolutely loved it. Abu Dhabi is safe – for female and male travelers, for solo and family travel. As always, exercise common sense, but you should not be afraid to travel to this Islamic country (as I also think Dubai is great for solo female travel). Abu Dhabi is one of the best destinations in the Arab world for solo female travel, so enjoy! I recommend visiting Abu Dhabi between October-March, as it gets really hot in summer. I visited the UAE several times and it was actually too hot for me in October and April (and even March is still a bit too hot for me), but I am not good with heat.In December however, some days were really foggy and it was hard to do “sightseeing in Abu Dhabi” as I wished to do – luckily, I had seen many parts of Abu Dhabi before, but it can be a bummer for Abu Dhabi first-time visitors. If you enjoy heat then April and June, and September should be fine as well but be aware that some activities are not offered during the summer months and some restaurants etc. are closed during the time. If you visit the UAE (or any Islamic country) you probably should avoid the time during Ramadan as well. During this time, which last about 4 weeks, Muslims are not allowed to drink or eat during the day, which has also an effect on tourists as some restaurants are not open during the day and drinking and eating in public is not welcome. There is also a stricter dress code and less alcohol available. 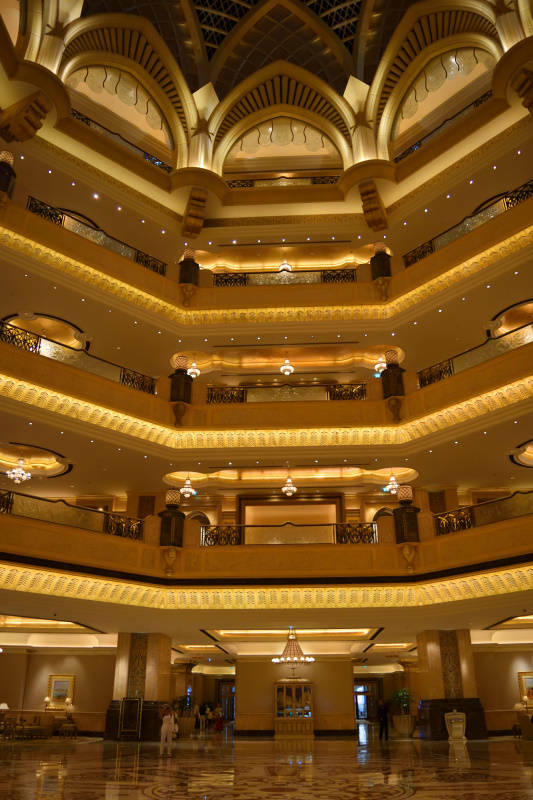 Abu Dhabi has some amazing hotels – the standard is pretty high and so are the prices. Though Abu Dhabi´s hotels seem a bit more affordable than in Dubai it is not a budget destination, even cheaper hotels offer good value for money. Here is my detailed accommodation guide for Abu Dhabi – below you find a short summary of my recommendations. EU citizens, as well as US-Americans, will not need to apply for a visa. You will get a free visa upon arrival. Click here to find out if you need a visa if you have a different nationality. While Dubai is crazy, Abu Dhabi is a nice getaway from the hustle and bustle though it still has developed over the last years and though the most famous sight might be the Sheikh Zayed Grand Mosque there is much more to see. 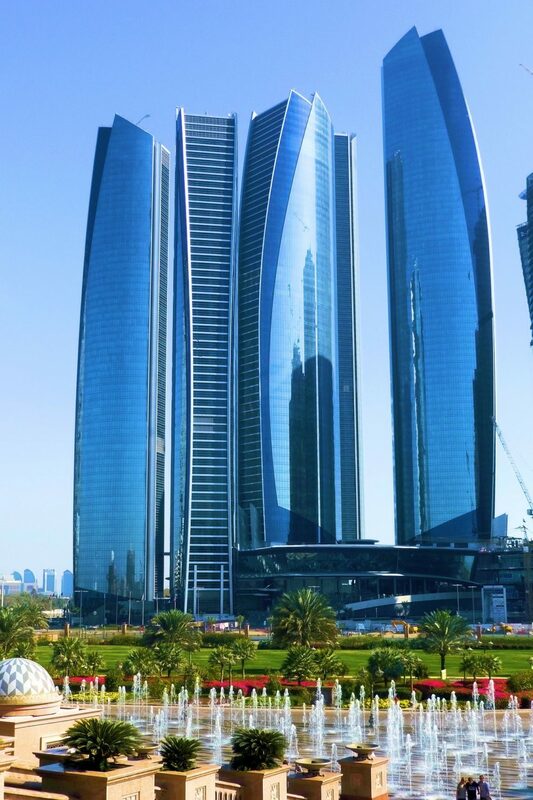 If you enjoy relaxing at the beach, visit luxurious hotels and do some shopping activities you will not get bored at all, but if you have only a few days in Abu Dhabi here are some tips on the top places to see in Abu Dhabi. Find out about the top tourist attractions and points of interest in the capital of the UAE – these are also great things to do for solo female travelers. Heading to Dubai as well? Then read my tips on the best things to do in Dubai by clicking here. Find a great mix of free activities in Abu Dhabi and some great paid activities. While Dubai wants to break all records, Abu Dhabi is home to the most beautiful building in the world! The Sheikh Zayed Grand Mosque is probably the most important sights in Abu Dhabi and – in my opinion – the best place to visit in Abu Dhabi. The mosque is one of the most stunning, or probably the most building I have ever seen and it is not a surprise it is one of the best tourists places in Abu Dhabi. The beauty is just beyond words, and it is worth to crowds and the abaya you have to wear despite the heat. If possible, visit it during the day and at night time as well. The best: it is a free thing to do in Abu Dhabi – free, free, and totally awesome. There is no entry fee and you must follow a few rules when visiting. 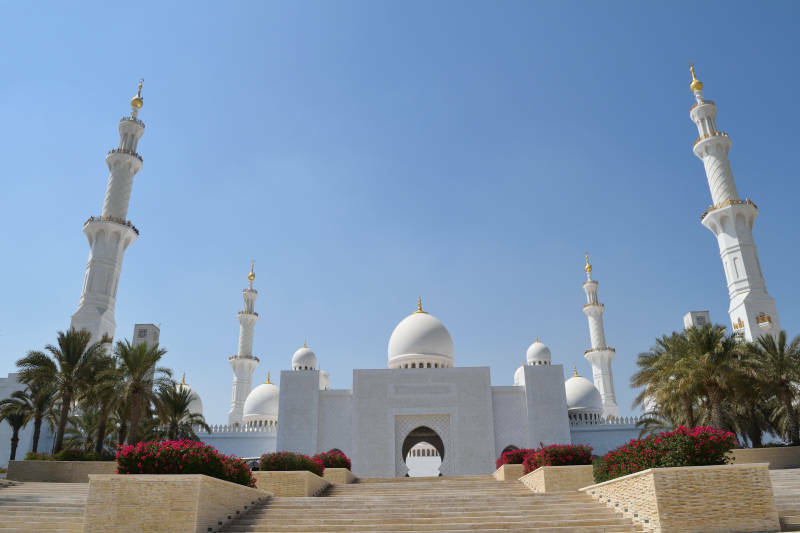 Click here to find out more about the most beautiful place in Abu Dhabi and what to know before visiting the Grand Mosque. How to get there: The mosque is located at the “beginning” of Abu Dhabi. Whether you are coming from Dubai or Abu Dhabi airport – it is almost impossible to miss it. There is a bus going from Abu Dhabi Downtown, or you can take a cab. Personally, it is probably great to start your trip in Abu Dhabi with. Especially if you just arrive in Abu Dhabi from Dubai or the Abu Dhabi airport (as this is one of the main attractions you will see in Abu Dhabi). While it is pretty to look at any time of the day, it has a special charm at sunset – though I am 0% religious, I love the call of the muezzin. If I am in a place with a mosque and hear the muezzin´s call I get goosebumps all over – if you have the chance try to visit during prayers time (5 times a day). It is closed on Friday mornings for the big prayers though – so keep this in mind when doing your Abu Dhabi itinerary. Visit Corniche, which is a beautiful promenade with access to the public beach. In my honest opinion, the beaches in Abu Dhabi are nicer than in Dubai. The water is clearer and the sand finer, and in October, the beaches and the promenade were still pretty empty. 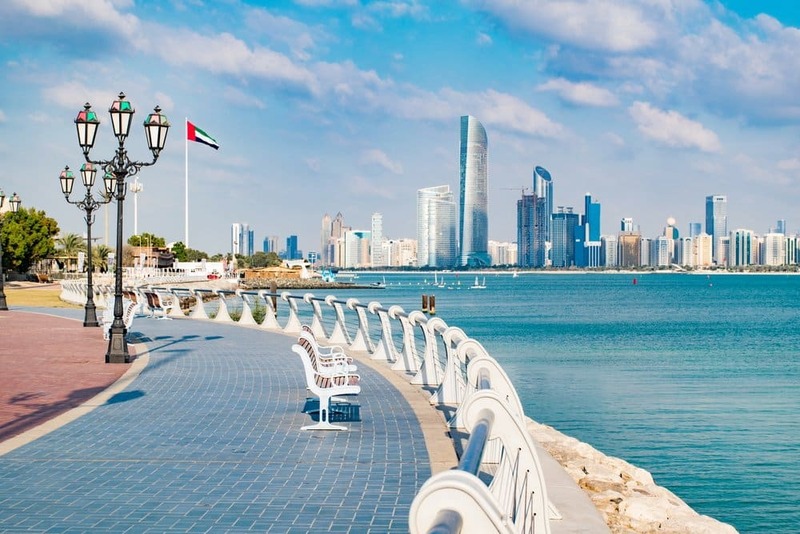 It is also a nice place to just walk, jog, or ride a bike with some nice views of Abu Dhabi and so visiting Corniche is one of the places in Abu Dhabi – and another free thing to see in Abu Dhabi. 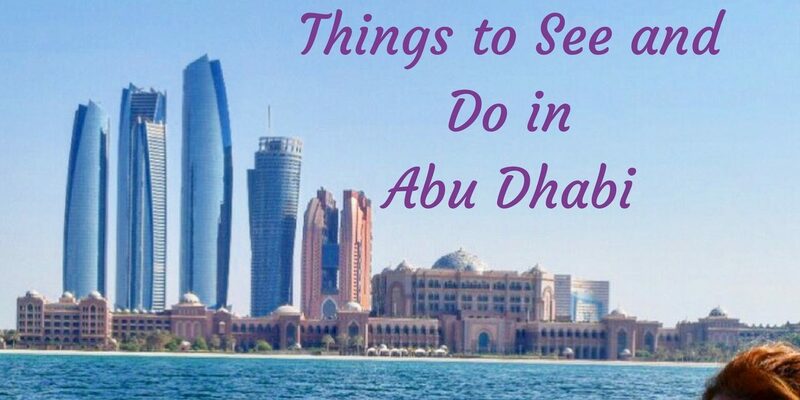 Here are more fun things to do in Abu Dhabi on the first day, as they are all close by. Abu Dhabi sightseeing is not complete without a stop at Heritage Village. Heritage Village is a small recreation of a traditional desert village with crafts workshops & monthly cultural festivals. 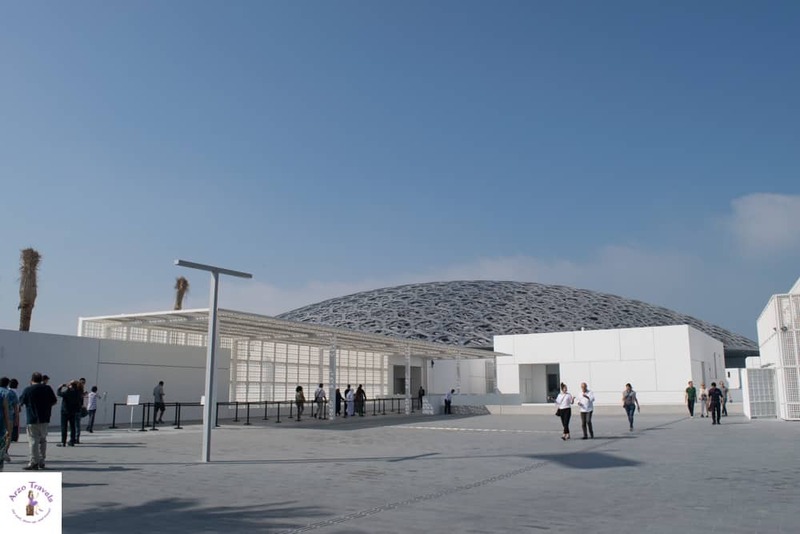 It is a very cute place, though quite small – if you do not visit any workshops you will not need a lot of time to visit this point of interest in Abu Dhabi but it is still worth a visit – and it is another free activity in Abu Dhabi. It is located at the “end” of Abu Dhabi, so you can either continue to the Emirates Palace afterwards, Corniche, or to Marina Mall. Visit the Emirates Palace, which is one of the most expensive and luxurious hotels in the world and one of the main tourist attractions in Abu Dhabi. I had lunch at one of the restaurants, but you can visit even without dining there – the guards might ask you what you’re doing there so be prepared for an answer. The Emirates Palace is even one of the best places to visit at night in Abu Dhabi. Many tourists find their way to that luxury hotel and the buildings around are illuminated and it is fun just watching people. 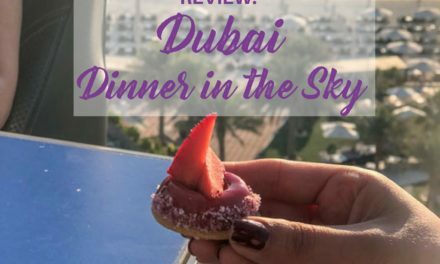 I took the chance and dined at one of their restaurants and then headed to the backyard – which I had all to myself and which is a nice way to splurge yourself in luxury even if you do not stay overnight at the Emirates Palace. If you are thinking about staying here overnight click here to find out about the prices. For day 2, I have a few suggestions though you most likely will not be able to do them all- but given, that we all have different tastes and do not like 100% the same, you can just pick those activities you like for your day 2 in Abu Dhabi. Go (window) shopping. Of course, Abu Dhabi has some big shopping modern centers which are also one of Abu Dhabi tourist attractions, like Marina Mall, though they are not as numerous and bis as in Dubai shopping is one of the most popular things tourists and travelers do. If you like to get souvenirs or traditional clothes,, I recommend getting them from smaller markets, so-called souks, which you can find in many places – do not forget to bargain when you buy from the souk. And here are more things to see in Abu Dhabi. 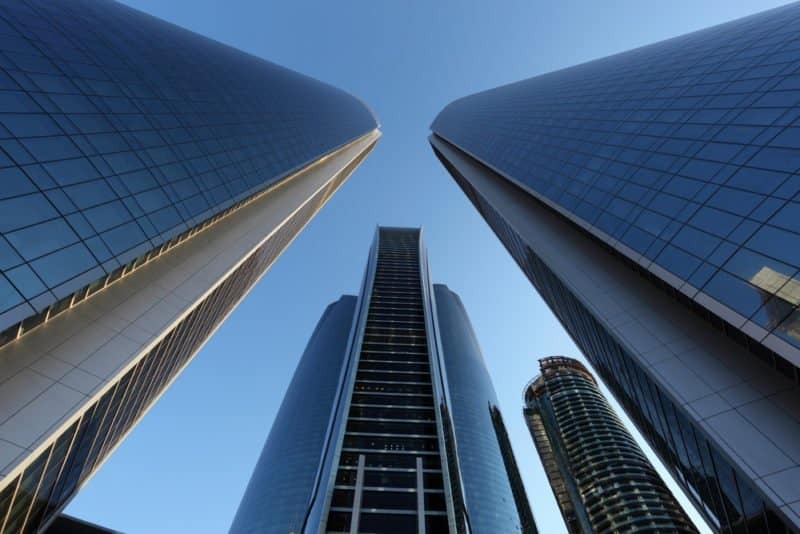 To see Abu Dhabi from above go the to Etihad Towers Observation Desk. You might remember those views from the Furious 7 movie. As I have a thing for great views it was on my list but I did spend too much time Zaya Nurai Island so that I ran out of time. It was on my list for the second trip to Abu Dhabi, after reading the reviews a visit seems to be totally worth it and is another great point of interest in Abu Dhabi, but Abu Dhabi in December can be quite foggy and so I had to postpone my visit again – however, if you have a clear day you should visit (hotel guests can get up there for free, other guests have to pay an entrance fee while they also get a voucher they can use for a drink at the restaurant). Cool down during a speedboat tour. My top tip for a hot day in Abu Dhabi is to do a speed boat tour in Abu Dhabi. You see a lot and can enjoy the fresh breeze. 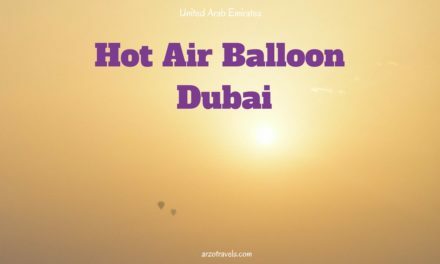 It took about an hour and it is the most fun thing to do in Abu Dhabi on a hot day – it is extremely refreshing, you can forget the heat even in the hottest summer months. The meeting point depends on the boat tour. Tip: if your boat tour starts from Emirates Palace, you can combine the trip to the Emirates Palace with the boat tour. Click here for more information on the speed boat tour. 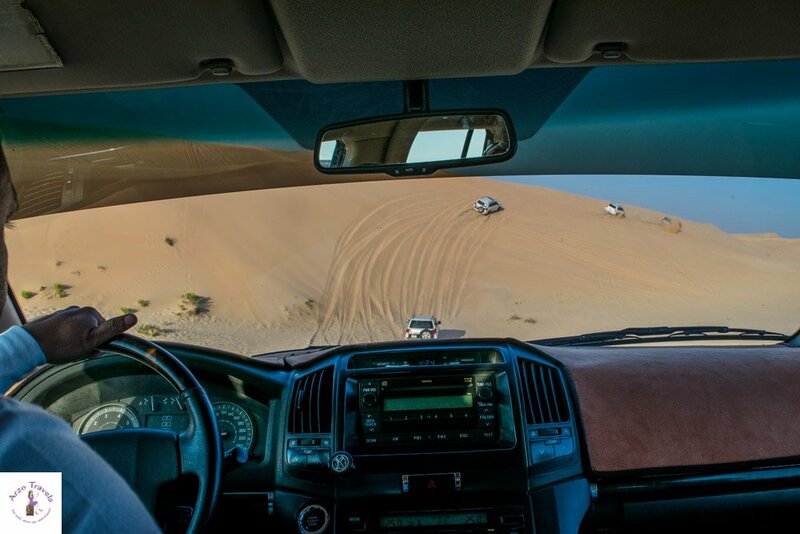 One of the most fun things to do in Abu Dhabi is… to go on a desert safari. 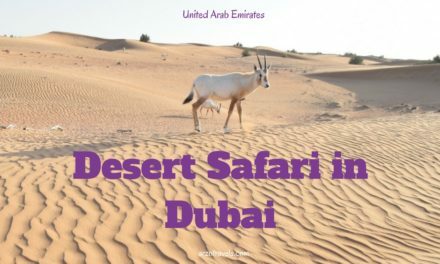 I have done a couple of desert safaris in Dubai and totally loved them – they were actually one of my travel highlights and so I had to book one desert safari in Abu Dhabi…. 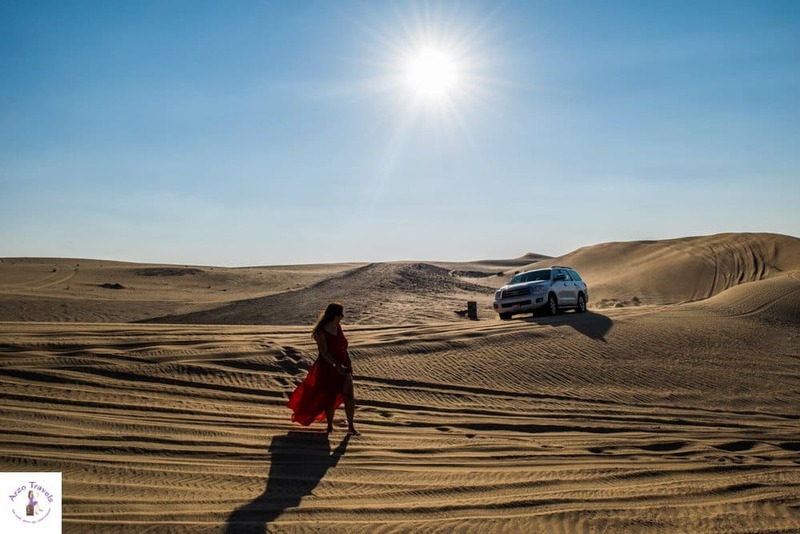 If you have not planned any desert safari in Dubai you should definitely do a desert safari in Abu Dhabi. On my last trip, I visited the UAE with my cousin and I booked the trip for both of us. After asking her about the highlight of the trip to the United Arab Emirates one of the first things she said was “The desert safari in Abu Dhabi”. 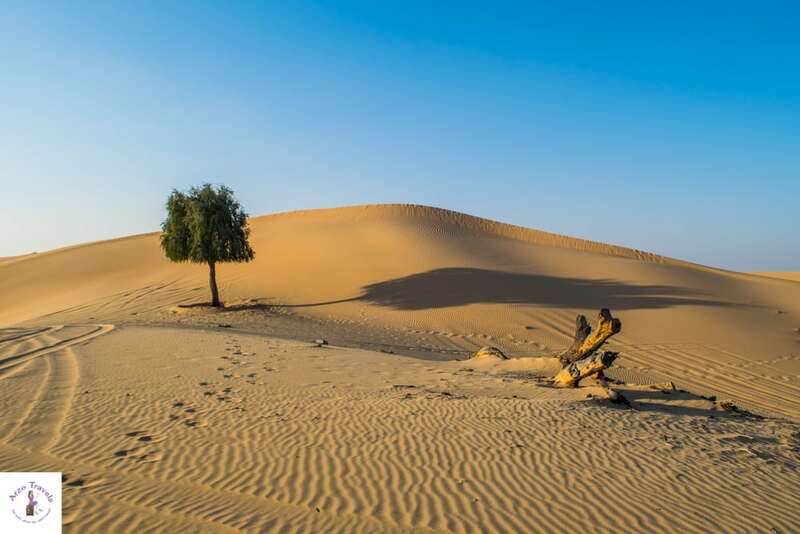 The choices of desert safaris in Abu Dhabi are not as numerous as in Dubai but my two favorites in Dubai are also offered in Abu Dhabi. My top recommendation for a desert safari in Abu Dhabi is the one in the evening with dinner under the stars – what an experience! You can click here go find out which tour I did exactly and click here to find out about the latest rates. If you like a desert safari and would like to test sand boarding as well, I recommend this desert safari. Okay, ready to find out about more things to see in Abu Dhabi? Need more ideas on what to see? Here are some more ideas for your Abu Dhabi trip. Ferrari World is rated as one of the best activities in Abu Dhabi and considered as one of the top places to visit in Abu Dhabi, so visit Ferrari World in Abu Dhabi. If you are into theme parks and/or interested in cars, it should be on your list, but plan a full day for that activity. As it is located at “the beginning of Abu Dhabi” it is a great activity to start with coming from Dubai and heading back to Dubai. 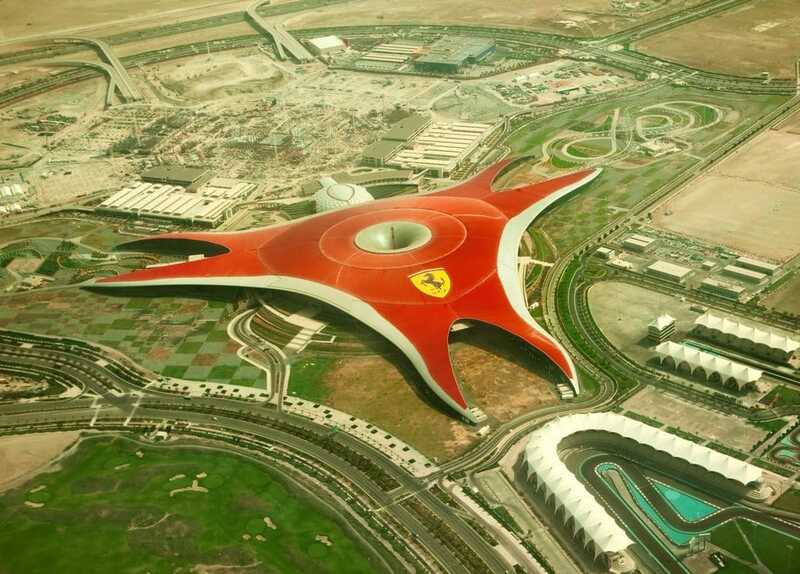 Click here to check out the best rates for a day ticket to Ferrari World. Have I mentioned that Abu Dhabi has some amazing beaches? No, then it is time to experience them (you might have gotten a good idea when you visited Corniche, though the best beaches are more secluded and private. 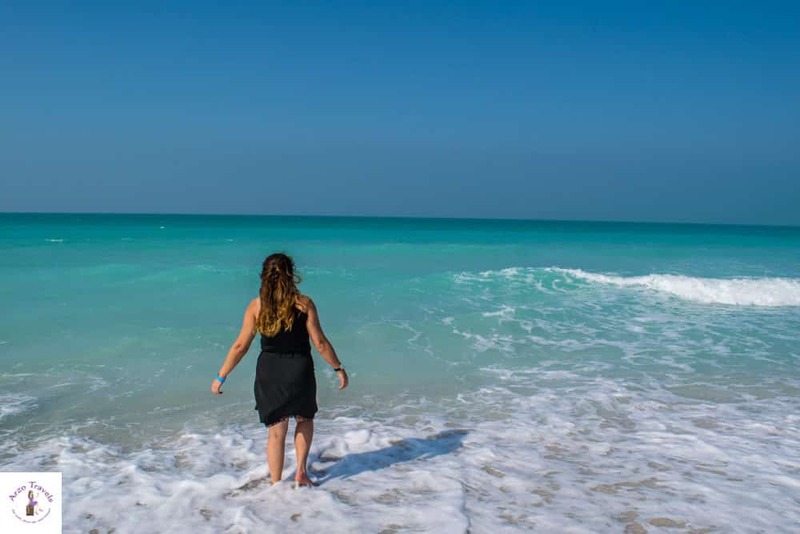 Relax at Saadiyat Island – it is probably the most beautiful public beach in Abu Dhabi and one of my top recommendations for the most beautiful place to visit in Abu Dhabi. Though it is a public beach, you have to pay about 5€ entry (for 10€ you get a lounge and towels as well). Though the beaches at Corniche are pretty and free, this is even more beautiful and probably one of the most beautiful places in Abu Dhabi – it is also not very crowded and it feels save enough to leave your stuff at the beach while hopping into the water (I admit, I tend to be a bit paranoid in some places and never leave my stuff unattended). 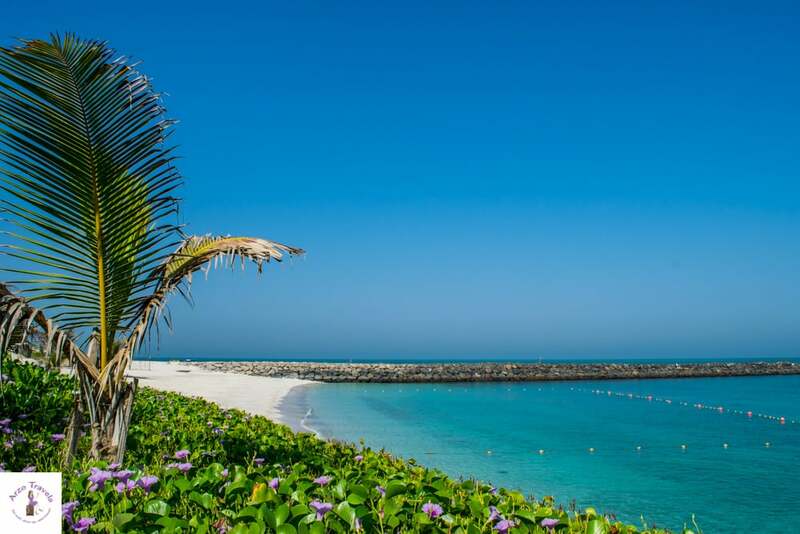 If you stay in one of the few hotels on Saadiyat Island you will have free access to the hotel beach. How to get there: I have not figured out if a public bus is getting there, but it is a bit farther away and I recommend getting there by taxi. Visit the Louvre. Yes, Abu Dhabi has just gotten its own Louvre and once you are on Saadiyat Island you can visit the newly opened Louvre museum – which is an art and civilization museum and has opened in November 2017. I am sure it will become one of the main Abu Dhabi´s attractions in a very short time – I stopped by but the lines were quite long, so I did not get into it. Click here to see prices for tickets and tours of the Louvre and get skip-the-line tickets. I really enjoy the beaches in Abu Dhabi and so I would plan in another day at the beach. When in Abu Dhabi you need to plan in a day trip to this private island. I wanted to do several of the activities in Abu Dhabi which I did not do, as for example visiting the Etihad Towers. I missed out because I spent too much time at Zaya Nurai Island Resort which is a private island that has been voted to one of the most incredible islands by Conde Nast Traveller UK. Depending on your budget you could either book one of their incredible villas or if you are on a budget you can get a day pass which is surely worth each penny. Okay, in case you have not planned in a trip to Dubai, then it is about time to do so. If you actually only stay in Abu Dhabi, then you really should do a day trip to Dubai. I know, not everyone likes the idea of a busy city, but I highly suggest at least a day trip to Dubai. There are buses from Abu Dhabi to Dubai for about 10€ ($11) return – however, whenever I wanted to use them, it turned out it is still not perfect as I would end up in the middle of nowhere in Dubai. So, I suggest either doing a guided tour from Abu Dhabi to Dubai, or to splurge and take a taxi from Abu Dhabi to Dubai (prices depend on your starting point, but I always paid around 60€). In Dubai there is a lot to do – what exactly? Well, find out here. Okay, I hope, you will have a wonderful trip to Abu Dhabi and enjoy your days, whether you stay 2, 3, 4 or 5 days in Abu Dhabi. Disclaimer: Zaya Nurai Island Resort invited me as their guests. But all opinions are my own. This post also contains affiliate links – this means I might earn a small commission when you buy a product/service via my links (at no extra cost to you). More about it here. NextReview: Get a Stockholm Pass?